Roughly, 200 million Muslims live in India. In some parts of the country they are in sufficiently large numbers and in others they are in limited numbers for historical and geographical reasons. In some states the Muslim population exceeds 10 percent. In Andhra Pradesh Muslims constitute 8.9 percent of the total population of the state. According to the 1991 census, the ratio of Hindu population in Andhra Pradesh was 89.26 percent while it was 91.76 percent according to the 1911 census. The 1971 census showed that there had been continuous decline in the Hindu population, their ratio had come down to 87.72 percent. But during the last decade their population rose upto 89.26 percent. During the last decade there was a two percent increase in the Muslim population in Andhra Pradesh. In 1911 the Muslim population was 6.65 percent and in 1991 it increased to 8.91 percent. Geographically, the distribution of Muslim population varies in different areas. For example, in coastal districts like Vishakhapatnam, Vijayanagar, East and West Godavari, Muslims are sparsely populated. In Nalgonda, Warangal, Karim Nagar and Krishna districts their population ranges between five to six percent whereas in the western coastal districts of Guntur and Nellore, Muslim population is around nine percent. After the reorganisation of some districts in 1971 the population of Krishna, Nellore and Guntur went up to around nine percent. Telugu is the dominant language in these districts. Muslims consider it as their mother tongue and meduim of education. In Rayalseema region’s Chittor district, the southern part of the state (adjacent to Tamil Nadu) the population of Muslims is fairly large. In Kurnool, Cudappa and Anantpur their population is approximately 17, 15 and 17 percent respectively. In Telangana region, there are 19 districts. 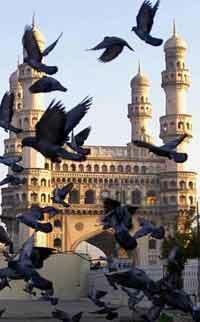 Hyderabad, the state’s capital falls in this region. Ratio of Muslim population in Hyderabad and Sikandarabad is approximately 40 percent, which is the highest in the entire state. In Hyderabad’s neighbouring districts like Nizamabad and Medak, Muslim population is fairly large. There are 110 Assembly constituencies in Telangana region where Muslims exercise great influence. In Hyderabad city alone there are 13 Assembly constituencies and at least in 5 constituencies Muslims are in a majority and so far four persons have been winning on Majlis Ittehadul Muslimeen (MIM) tickets. In Telangana region Muslim culture and civilisation had the dominating position but in coastal areas, Muslims are more familiar with Telugu language and hence they are influenced by Hindu culture. Ever since Telugu Desam Party came to power in the state, Muslims have been facing discrimination. In many Telangana districts though Urdu has been made the second official language, its implementation is slow. In government jobs, whether be it in Telangana region or whole AP, Muslim representation is not more than two percent. Therefore, now a demand is being raised for their reservation in jobs, though some backward sections of Muslims like Qureshi and Naddaf (whose ancestral profession is carding of cotton) have already won reservation in government jobs and educational institutions. Some backward sections of Muslims have virtually lost Muslim identity and are fully absorbed in local Telugu or Hindu culture. Even their names are on the pattern of Hindu names and have prefix and suffix like Anna (brother), Akka (sister), Amma (mother) and Appa (father). By their names they seem to be Hindus though they are Muslims. However, with the influence of the Tablighi Jamaat, they are now shunning their Hindu identity and changing their names. They are now adding ‘Bi’ or ‘Bibi’ to girls’ names and ‘Shah’ to boys’ names and trying to learn Urdu and Qur’an.